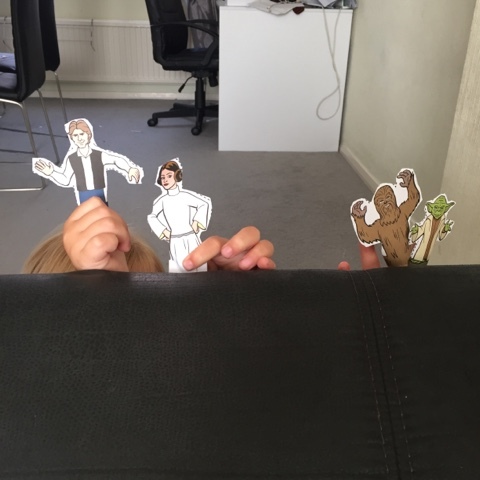 The youngest two were having fun entertaining me with their very own Star Wars puppet show the other day. Simple task making the puppets kept them busy for a good while and they had so much fun coming up with ideas of what the characters were doing. Was nice to see their imaginations hard at work instead of having their eyes glued to the TV screen! I miss my kids doing this and calling us in to watch a show. Great fun. That's so cute! It's always good when kids find something to do that doesn't involve screens. So sweet! I worked in a school recently and the children in the class put on a play that was supposed to be about a serious subject. It was so funny, I had to try my hardest not to laugh... Very difficult! Love it...What a fun photo! Aww this sounds fun! It really is the simplest of things that keep them amused.